For obvious reasons, Facebook’s looking to up political advertising transparency ahead of the midterms. 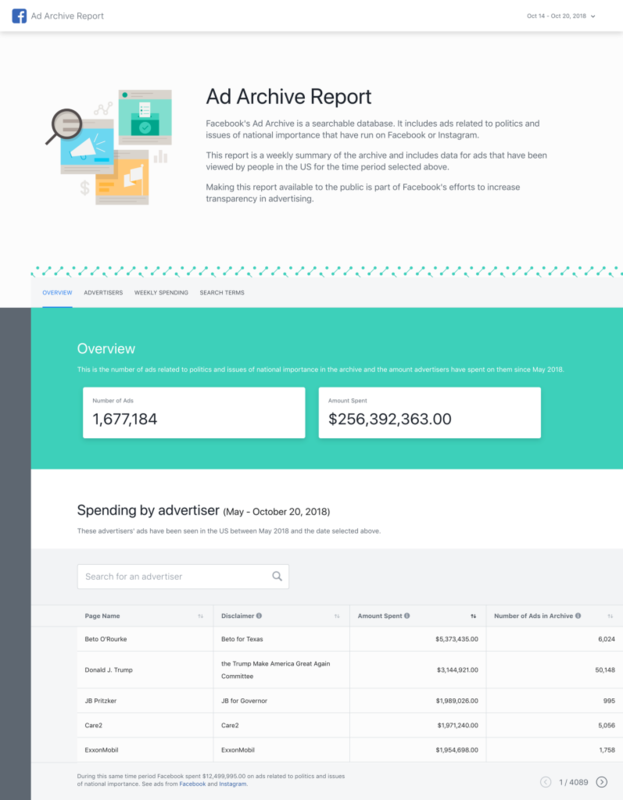 Back in May, the social network introduced Ad Archive, a searchable database of political ads in the U.S. It’s following up the feature with a new Ad Archive Report, a weekly snapshot of political spending. The survey offerings a breakdown of top spenders by campaign, including the amount spent and the number of ads run. The first report for ads on Facebook and Instagram from between May and October 20, shows a total of $256 million spent across 1.6 million ads. The number includes $12 million related to Facebook’s own election integrity and getting out the vote ads. Other than that, it probably won’t come as a surprise that Beto O’Rourke’s tooth and nail Texas fight leads the way. The Beto for Texas campaign has spent $5.3 million across just over six thousand ads in that period. Donald Trump’s “The Trump Make America Great Again Committee” is in second place at $1.9 million, while “Donald J. Trump for President, Inc.” is in eighth place at $1.6 million. That’s just behind the $1.7 million spent on Tom Steyer’s “Need to Impeach.” Those will no doubt see a boost as we head toward 2020. The archive houses ads reaching back to seven years. The site is also offering up an API for researchers to tap into the data.